Below are my findings from taking the camera on real-life overseas travel for a week. Note I have no affiliation with Panasonic, I just felt like writing about my camera. I think ZS implies "Super Zoom" and TZ means "Travel Zoom". 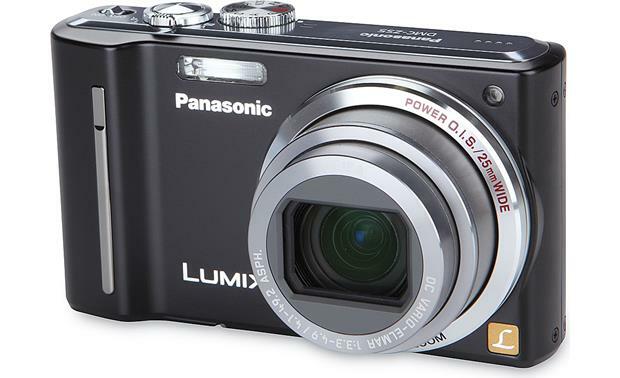 The ZS5 is the US camera specially imported by SA Camera, because the European version, the TZ8, is not yet available in South Africa through the Panasonic distribution channels. The difference is the charger (US vs EU plug) and NTSC vs PAL TV-out. The charger is a pain in Europe where travel adaptors feature a rim that prevents the US pins on the charger from actually reaching the socket. Fortunately the lithium battery lasted over 330 photos and a few minutes of movie (Friday to Monday), and only needed 10 minutes of charging at a Zurich camera shop to last the rest of Monday. The ZS5/TZ8 is also the baby brother of the ZS7/TZ10, the difference being a smaller LCD, lack of RAW recording, lack of AVCHD encoding for hi-def video, and lack of a (power-sucking) GPS to geocode all your photos for you. Nonetheless the ZS5/TZ8 is a great travel companion: small and lightweight, it's happy to do all the hard thinking for you, and has great zoom for zoo visits, and you can even tell it what time zone and location tag to use for the dates of your trip. Lastly, the ZS5/TZ8 and ZS7/TZ10 are successor to the ZS3/TZ7 that was released in early 2009. Most of the time I stick with the iA or "Intelligent Auto" mode, which on half-press will select a scene type (portrait, scenery, action, night portrait etc), detect normal vs macro mode, select ISO rating, shutter speed and aperture, flash mode, picks out the subjects to focus on. iA mode does have a few parameters including maximum ISO rating, forcing flash-off the resolution / aspect ratio (4:3, 16:9 or 3:2). If I don't like the settings, I release the button, half-press again and iA will often pick different settings, for example focusing on the zoo animal instead of the cage. Specifying "ISO-max 400" is handy for auto-mode because the higher ISO levels that it might pick - up to ISO 3200 for a motion-shot in the dark - are too grainy to be of any use. The zoom toggle maxes out at 12x zoom, but hitting the extended zoom button will let it go up to 16x zoom at a lower resolution (center of CCD), and hitting the button again will digitally zoom to 32x. Once more goes all the way back to 1x zoom (wide-angle). The image stabiliser ensures photos are not blurry except if the subject was stationary at half-press (slow shutter selected), but then starts moving after the half-press. If it is very dark and your hands aren't steady the camera tries to compensate by using the highest ISO and fastest shutter feasible, for a dark and grainy but only slightly blurry photo. If you use a tripod for the night scenery it will select a longer exposure and take a good photo. I also use the P or "Programmable" often in situations where iA gets it wrong, typically with funny lighting or macro scenes. I prefer programmable mode to selecting one of the three-dozen specific scene modes. P-mode will still select the shutter, aperture, ISO and auto-focus, but it has a quick-menu to configure all the scene related settings like exposure, white balance, macro mode, ISO mode (specific ISO or auto+ISO-max) flash mode, auto-focus mode, stabiliser mode and dozens of other settings. The P mode has an option to record 5 seconds of sound alongside the photo, which is handy for recording captions you would otherwise forget, like plant names. For special shots I use manual (M), shutter-priority (S) or aperture-priority (A) modes. S-mode has manual shutter speed and auto-aperture, useful for long nigh-time exposures taken with a tripod. Aperture-priority mode is the opposite and is useful for shallow-field or deep-field shots. Manual mode takes manual shutter, aperture and exposure, but will still do automatic ISO, white balance and such if you let it. The image quality is ok for a compact if you don't let the ISO go above 400. The small high-density CCD has a lot more per-pixel noise than the small low-megapixel CCD's of older cameras or the large CCDs of the four-thirds DSLRs. But the noise is mainly noticeable at 1:1 zoom - you don't see it at screen size, scaled down for web albums, or in print. The movie quality is meh, it's ok provided you pan very slowly, but so far I haven't taken anything worth uploading. I do have a reliability complaint, in that the LCD is easily scratched by just one grain of sand. Do not let the camera anywhere near sand or dirt. Also, I expect that to sit on the camera or drop it once will be the end of it. It's also susceptible to humidity, temperature and pressure changes (well, to condensation), so I'm concerned that the dirt and dew found on overnight hikes will bring the camera to an early death if I regularly take hiking. So far the camera is two weeks in and going strong. You can find more reviews of the DMC-ZS5 on photographyblog, dpreview. Do you have any thoughts to add on the DMC-ZS5 / DMC-TZ8 camera? 4 weeks of usage on my ZS5 and the lens stopped working. Only used in urban settings with no sand, rain, dirt to speak of. Customer repair center has had the camera for 1 week and still have no idea where the camera is. The camera is still going. I've taken it out a few times since the overseas trip, but only once hiking. I still have to see how it does on multi-day hikes, where your stuff gets dirty and condensation forms at night. I ordered a TZ8 on kalahari.net last month and used it on a 2 week trip to New Zealand. I am very pleased with the features and quality (and your review was very useful in the selection of this model). I just bought TZ8, I wonder how to use the "M" Mode. Is there any sites that I can reffer on? @GDN, in "M" mode you can adjust the shutter speed and aperture independently (A mode has auto-shutter in response to aperture and S mode has autdo-aperture in response to shutter speed). In M-mode just press the "Exposure" button as you would in S-mode or A-mode, then you can use the arrows to adjust shutter and aperture. Note: "Exposure" button does nothing in P (Programmable) and iA (intelligent auto) modes. I just had my second ZS5 die on me. As best as I can tell, it is a problem with the tele-lens mechanism. If I had to guess, I would say dirt or dust somehow got in there. I used the first one hiking, a lot. The second one went on exactly 1 canoe trip. The error it gave in both cases is "System Error (Focus)"
I can say with confidence that I did not abuse the cameras in anyway. They simply were used outdoors, in normal hiking type situations. Both were carried in Lowe cases when not out for shots. I can also say that other cameras that we brought on these trips have not had problems. I love this series of cameras, and think they take fabulous photos... but I would not use one for hiking or any outdoor adventures again. I have had my TZ8 for six months now and have been disappointed with it. In the fully auto mode (ia) it over exposes everytime, and I find the images are nowhere near as crisp as from my old Cannon powershot. I am putting it into a draw and there it will stay im afraid. I didn't find exposure to be a problem, but I do notice that the images are blurry when zoomed in. In other news I managed to slip while holding the camera a couple of months ago in Istanbul, which smashed the outer metal ring on the zoom apparatus. A repairman has since beaten the ring back into shape, but the focus seems to be out in portrait scenes, so into the drawer it goes for me too. On the way back in Dubai I bought its big brother the TZ-10 as a replacement (GPS, bigger screen, AVCHD recording). There was a basket full of TZ-10's on discount, and the camera model has been out for over a year now. For the TZ-10 I paid only half what I paid for the TZ-8 last year.